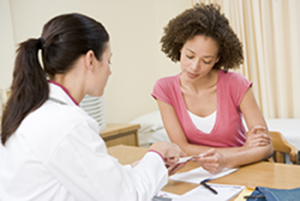 Find out at what age a woman should start visiting their OBGYN regularly. One of the things about growing up is that we need to understand the best ways to care for our body and to make the best decisions for our health. This is why seeing one of our Johns Creek, Suwanee and Alpharetta, GA gynecologists--Dr. Dori Kasparek, Dr. Supriya Rao or Dr. LaQuita Martinez--at least once a year is important for any woman’s health. Routine visits can prevent health problems and can even detect issues early. Find out when you should start coming in for routine visits. Most women should start visiting their gynecologist by the time they reach 18 years old. Of course, there are some professionals that say that girls between the ages of 13-15 should come in once they have their period and other professionals will say that these annual visits aren’t necessary until a woman becomes sexually active. Of course, our Johns Creek, Suwanee and Alpharetta OBGYN will be happy to tell you the best time for you or your daughter to starting coming in for routine care. The first visit is a great way for us to get to know you better. Putting your health into a doctor’s hands can feel rather nerve-wracking so it’s always important to really get to know us and ask any questions you have. Having an OBGYN that you feel comfortable turning to for any issue is vitally important for your health. If you are noticing any symptoms such as abdominal pain, cramping, unusual bleeding or abnormal vaginal discharge it’s always a good idea to bring up these issues with one of our doctors during your visit. We can check for signs of an infection or potential STD. The sooner we address these issues the better. An exam will also be conducted during your visit. We will usually perform a breast exam and pelvic exam, and starting at age 21 a Pap smear (and about every 3 years after that). The OBGYNs of Complete Women’s Healthcare in Johns Creek, Suwanee and Alpharetta, GA are here to provide you with compassionate, gentle care when you need it most. Turn to the women’s health experts today and call our office to schedule your next appointment.